All three scales (72nd, 48th, 32nd) of this Digital Flanker scheme are captured on this sheet. This F-15C was the first of multiple aircraft from the 65th Agressor Squadron that were to be painted with this scheme that is patterned after a Sukhoi SU-30B Flanker demo scheme. After this aircraft was painted, it was announced that the 65th Aggressor Squadron would be disbanded and therefore, no other jets would be painted with this eye catching paint job. Coined with the nick-name "Digital Flanker" by squadron personnel, this aircraft debuted to the public at the 2011 Nellis Airshow. 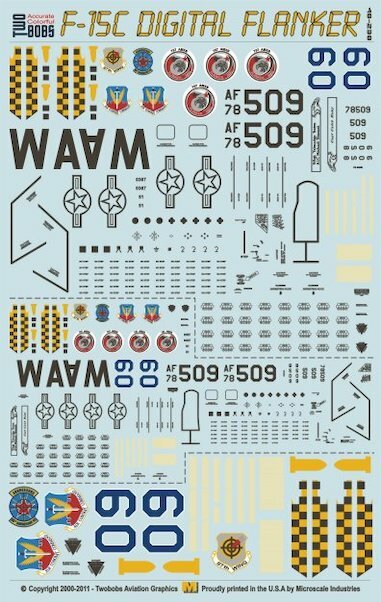 We have captured this jet in all three scales in this one product and include full stencils as well as intake/exhaust plug markings, wheel chock markings and ALE-47 Chaff/Flare dispenser markings. The ALE-47 markings represent the typical loadout carried by this aircaft during Red Air missions. A very accurate and complete sheet that was created with the direct assistance of 65th AGRS personnel.